The Great British Bake Off—or The Great British Baking Show, as it’s known in the U.S.—underwent some massive shake-ups this year, departing its old network, BBC One, for Channel 4, and replacing cast members Sue Perkins, Mel Giedroyc, and judge Mary Berry with Noel Fielding, Sandy Toksvig, and Prue Leith. Of the show’s on-camera talent, only Paul Hollywood—described, hilariously, as a “roguish Liverpudlian bread man” in this Guardian write-up of the switch—remains. Now, Channel Four has released the first photo of the assembled team, proferring up cupcakes as if to say, “We know. 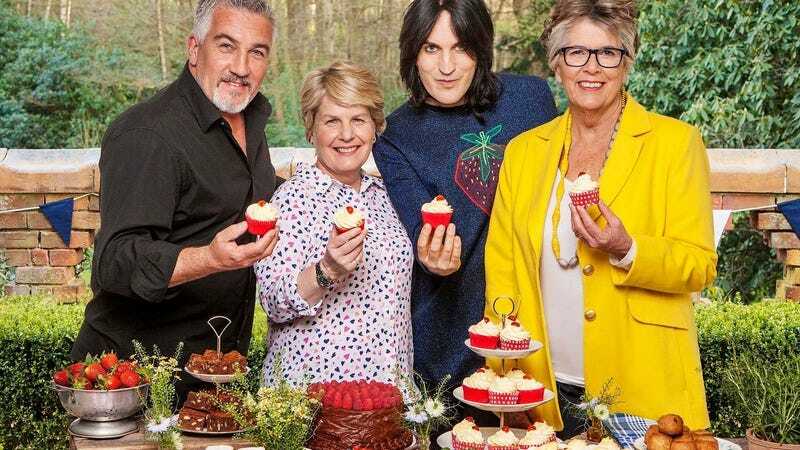 But come on.” The cakes all look lovely, but this version of England’s most popular TV show still feels a little off without Mary Berry’s stern twinkle at its center. We find ourselves gripped by the urge to reject the whole thing and throw it in the bin, just like when Iain threw away his baked Alaska after Diana took it out of the freezer, which we are also not over, because this is a very emotional cake-making show. But no. We need to give the series’ new hosts the same gentle, non-judgmental greeting The Great British Bake Off—reality TV’s most gentle, huggingest competitive cooking show—has given us. Even if it just won’t be the same without Sue and Mel around to make jokes about “getting a proper rise,” or comfort contestants during their bread-proving-based breakdowns.